They call it the colour mint but actually it’s a little more ethereal than that. The green to hit the big time in 2013 is gorgeous – it’s sage green with just a hint of shimmer; it’s what we call a ‘backstage’ green because it’s not in your face; this suggestion of green goes beautifully with white and a mention of pink. Use it on your eyelids too. Fairy dust nail varnish in barely there colours like light bronze or peach infused with enough glitter to take one back to nursery school’s crazy creative crayon corners is all the rage. Whilst extremely glittery, most of the newer nail varnishes are matte – so sparkley but subtle. In particular look out for the Zoya range – they’re metallic and beautiful. 2013 is full of new textures and finishes in the nail varnish department – so go wild! Yup. And not just on health shop shelves. Garnier is due to release a new line of ammonia-free hair dye called Olia in 24 different shades that will have more of us experimenting more often (just do so at least 6 months before your wedding, so that you can find the optimal colour). Moschino and Marc Jacobs favour Sixties beehives, Chanel favours twists, knots and looped ponytails, Stella McCartney goes for grunge, whilst Marni and Chloe love chic up-dos. Overall there is a rebellion against ‘prim and proper’ (says Vogue magazine) and a move to the no-fuss – particularly ponytails. Choose what suits your face and your dress (it wouldn’t go amiss to start with your hair, and choose a dress to suit that, rather than the other way around). Whilst lips are still in favour (if you do focus on yours use matte lipsticks and shades of plum and red) it is the eyes that are now the focus. 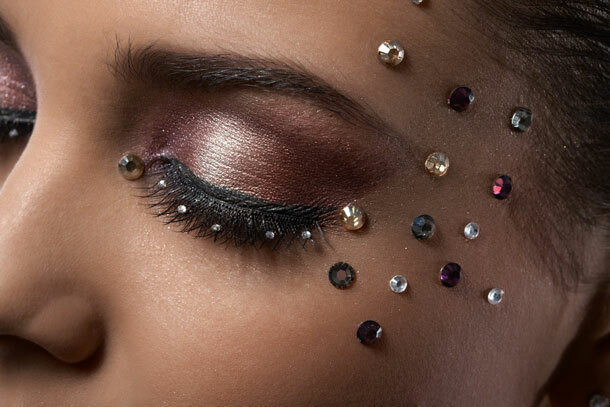 The emphasis is on coloured liner, jewelled lids and extra-long lashes. Play all you want, is the message from fashion. Oh, and bushy eyebrows.